Steak Diane is one of my favorite stop top steak dishes. 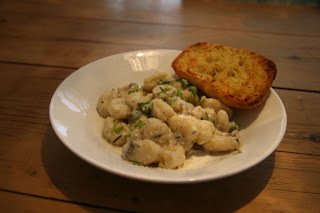 I love it so much I have another recipe on the website I did back in 2011 (check it out here.) This version doesn’t use cream, but it does use a lot of butter. You can also remove the mushrooms in this version, but I had some beautiful chanterelle mushrooms I found at the Farmers’ Market. I was in downtown Los Angeles last Friday and made a stop at Grand Central Market to pick up some meat at Belcampo. They had some petite top sirloin medallions that looked perfect. I bought four to make this dish. I often will use filet mignon, but these organic grass-fed top sirloin medallions add a richer flavor. Add 2 tablespoons and the olive oil to a saute pan on high heat. When it begins to bubble, add the salt and peppered steaks being cautious to not crowd the pan. Cook for five minutes on each side so there is a light browning. Once both sides are cooked, place steaks on a plate covered with foil to keep warm. Add the shallot and mushrooms to the pan and scrape up any browned bits. Add the Brandy and light the pan on fire being careful of a high flame. Add the lemon juice and worcestershire sauce and cook to combine for a minute. Add the remaining butter to the pan and return the steaks. Let it heat for another minute or two and then plate. This week’s Sunday Supper theme is Retro Recipes. I was reminded a couple weeks ago about one of my favorite restaurants when I made some German Lentil Soup from Portland Oregon’s Der Rheinlander. The soup was great, but it was missing something. Something I loved to eat as a child – Jägerschnitzel. It was one of the few ways I would eat mushrooms, the other being on supreme pizza. Jägerschnitzel is basically a bacon mushroom cream sauce on a wiener-schnitzel I had the recipe for Der Rheinlander’s basic schnitzel. All I needed was some inspiration for a mushroom cream sauce. I found a few on the web, but had an amazing mushroom cream sauce I’ve made many times before. Add some bacon and onions and I would be whisked back to the early 1980s eating a Jägerschnitzel in Portland. I may have the oldest of the retro recipes in this week’s Sunday Supper event. Both the Austrians and Italians claim to have invented the wiener-schnitzel. The Italians claim the dish was made in 1134 at a banquet for the canon of Milan’s St. Ambrogio Cathedral. For the schnitzel, wrap veal cutlets in cellophane and pound with a mallet. Heat a saute pan on medium-high heat with oil and butter. Rub some lemon juice over the veal and then dredge the veal in flour. A simple way to do this is to use a gallon ziplock bag and place about a 1/2 cup flour in the bag and shake the bag to coat the veal. Remove veal from bag and now with the egg and milk mixed together in small bowl, coat the flour dredged veal in the egg and shake so it is not dripping egg and coat with bread crumbs. Add the bread crumb coated veal to the saute pan and cook on each side until the bread crumbs are nicely browned, not burned, about 3-4 minutes each side. Remove the cooked veal from the saute pan and place on a plate. Now to make the sauce, add the bacon and cook for about 2-3 minutes. Add the mushrooms, onions, shallot, and thyme and cook for about 2 minutes then deglaze the pan with the cream sherry. Once the sherry has cooked off, about 1 minute, add the heavy cream and butter. Add the parsley and reduce heat to a simmer and place the cooked breaded veal back in the pan. After letting flavors combine for a couple minutes, serve with spätzle and some vegetables. I’d love to hear about some of your favorite Retro Recipes! Feel free to leave links and/or recipes in the comments. Also, feel free to join us for our live twitter chat tonight at 7pm (Eastern) using the#SundaySupper hashtag, and check out the Sunday Supper board on Pinterest. A simple noodle dish for a quick meal is something you should have in your home cooking back pocket. This dish takes about 10 minutes total time. You can do all the vegetable preparation and cooking while the udon noodles cook. Cook udon noodles according to package. I use dry udon noodles and they take about 10 minutes to prepare. You can use fresh udon noodles too. They can be found in your refrigerated section. While the noodles cook, cook the the onions and mushrooms in the peanut oil on medium heat for about 5 minutes stirring often until mushrooms are soft and onions are translucent. Add garlic and ginger and cook for 2 minutes. Add kale and cook for another 2 minutes until kale starts to soften. Remove vegetables from pan. Pour in water, miso, mirin, and soy sauce and whisk together. Add vegetables back to pan and keep on low heat. Drain noodles and rinse with cold water. Add noodles to vegetable broth mixture and cook for about 2 minutes on medium heat. Serve in bowls and add sliced green onions to top. My favorite way to cook filet mignon at home is to get a bit adventerous and light some cognac on fire, watch my wife’s head nod in disgust and listen to my kids say “daddy is burning the kitchen.” Oh well, that’s what home insurance is for, right? If you are going to catch your home on fire, and let’s hope I never do, doing it by cooking Steak Diane is a decadent way to do it. Fortunately, tonight we all survived. I downloaded the Food & Wine iPad application a few months back and as part of the download received a free issue (additional issues are $1.99 – a deal compared to newsstand prices.) In the free issue is a recipe from Emeril Lagasse for his version of Steak Diane. I decided to give it a try. The recipe is fairly easy to make and takes about 15 minutes which makes it an excellent gourmet choice for a work night. I accompanied it with some mashed red potatoes and… can yellow corn. Yes from a can… This is one of the rare moments I use canned vegetables, but I had picked up some canned corn from Trader Joe’s on a recent visit to St Louis (Dallas is supposedly getting them soon.) The canned corn from Trader Joe’s is like no other I’ve had. It is sweet and tastes nothing like other canned vegetables. Trust me. Back to the Steak Diane. This recipe was good though it lacked the richness of another version I make. It doesn’t mean this recipe is bad, in fact it’s quite good and with the addition of a veal demi glace, I used More Than Gourmet’s version at $3.99 a 1.5 oz size from Whole Foods, it made a flavorful, complex sauce. The sauce is the star here, but using great cuts of meat and quality mushrooms matter too. I’m just always suspicious of celebrity chef recipes in magazines or on cooking shows. I highly doubt they give their real recipe. Instead what we get is a slightly modified version that lacks the depth of the chef’s true approach to the dish. So here is Emeril’s magazine published take on Steak Diane. It is worth your time and I’m sure you’ll enjoy it. We sure did, especially minus any kitchen fire.